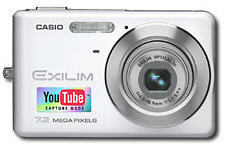 I did a bit of hunting online, and it appears that this line of YouTube-ready digital cameras has been out for some time (available since August 07 in the U.S.), but I have to admit that this is the first time that I have seen them. This positioning strikes me as being a little bit of marketing genius from Casio. There are at least 65,000 videosposted to YouTube per day, and eight hours of new video posted per minute – so there are a large group of power users out there who would love a camera that is set up to make it easier to send their videos to YouTube. That is, if the cameras are any good. I didn’t come across a single negative review of the cameras. You know about YouTube, but have you heard of Hulu or Joost? This entry was posted on Friday, November 30th, 2007 at 2:08 am	and is filed under Google, Product reviews, Video, YouTube. You can follow any responses to this entry through the RSS 2.0 feed. Both comments and pings are currently closed.